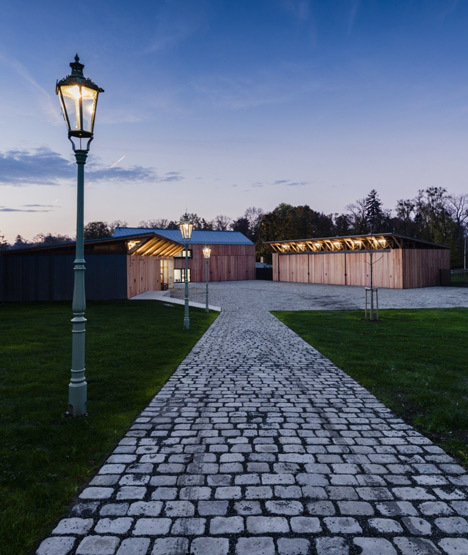 An old cobblestone street paves the way to this timber building complex, designed by Architekti DRNH for the upkeep of historic gardens in the grounds of a seventeenth-century Czech chateau (+ slideshow). 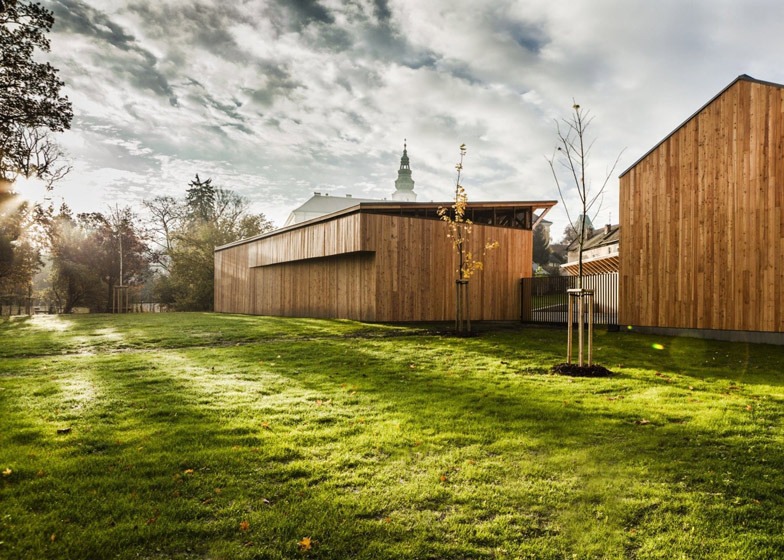 Set in the gardens of a Renaissance period house in the town of Kromeriz, the buildings were designed by Czech studio Architekti DRNH as part of the National Centre of Garden Culture – an education facility dedicated to the care and maintenance of historic gardens across the Czech Republic. 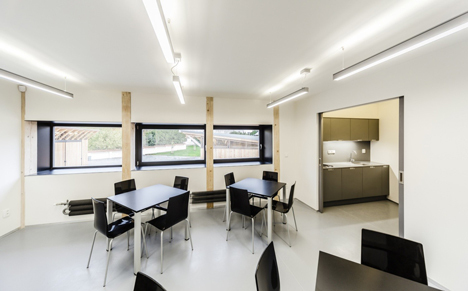 The complex comprises a cluster of three buildings positioned around a public courtyard. They include a storage unit for gardening equipment and facilities for the groundsmen, designed to serve as a model for other historic gardens. 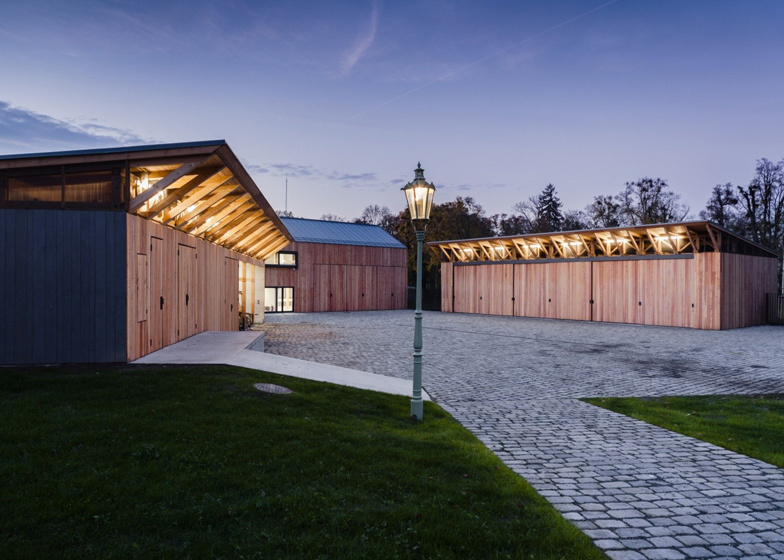 The architects drew inspiration from provincial agricultural buildings, creating humble wooden structures that respect the Unesco World Heritage-listed surroundings of Kromeriz Chateau, the former residence of an archbishop. 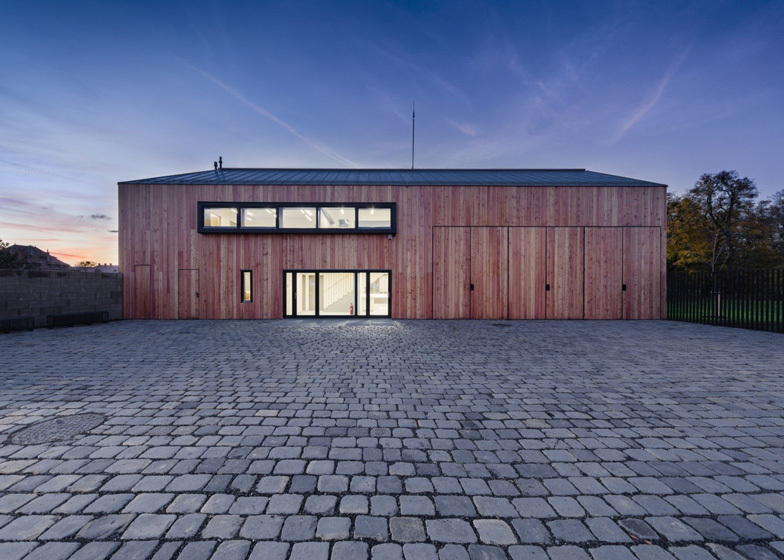 "The design of each individual building references the period in which they were built but, at the same time, create the atmosphere of traditional farm structures," Architekti DRNH explained in a statement. Traditional carpentry techniques were used to construct the complex. Locally-sourced larch clads the facades, which will gradually fade to grey to show show the age of the buildings. 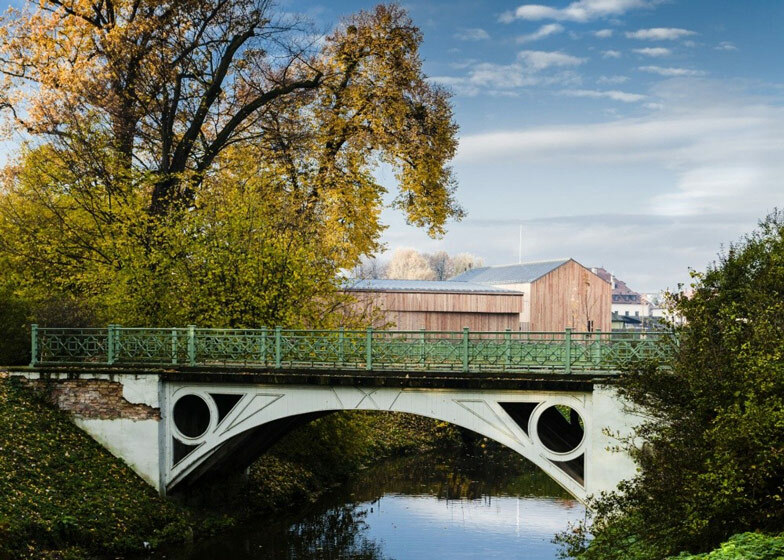 "The final appearance integrates the texture of oxidised and weathered wood, which will allow the structures to become an organic part of the old chateau gardens," said the studio. Asymmetric roofs slope up gently towards the facades, revealing exposed spruce supports and rows of spotlights that light the courtyard by night. 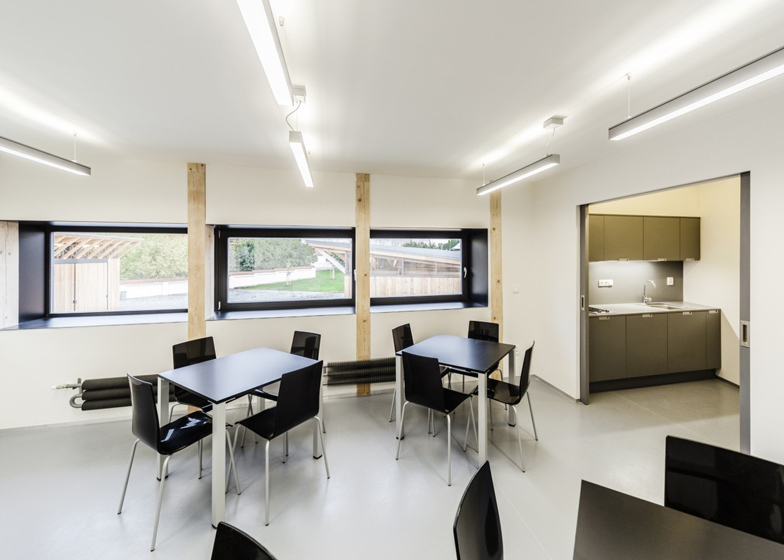 The exterior of the central building is punctured by black framed windows and benefits from natural ventilation through the roof. Inside, a cafeteria provides space for garden workers to relax in between shifts and a work station creates an area for managing restoration projects. The western section of the complex is used as a storage structure and backs onto a newly established lawn, which is open to visitors during the day. 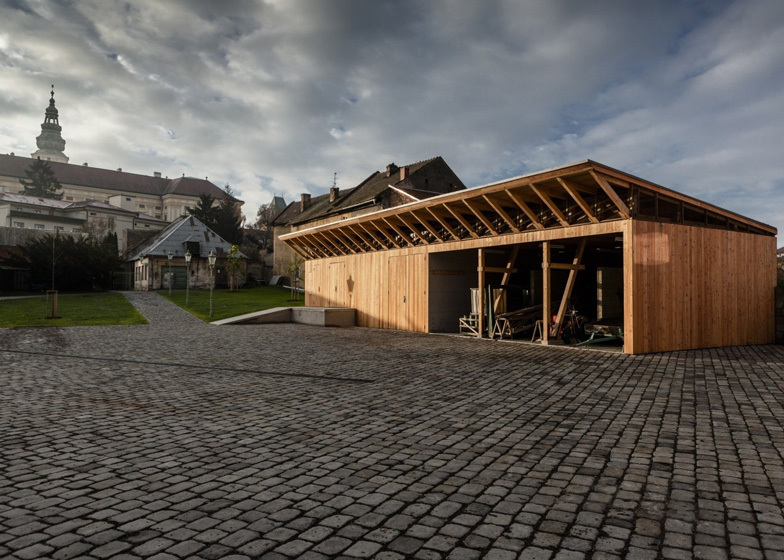 On the other side of the courtyard, a garage houses larger gardening equipment and vehicles. Water fountains and symmetrical flower beds lined with statues of gods surround the new buildings and an original cobblestone path illuminated by cast-iron street lamps leads to the entrance. 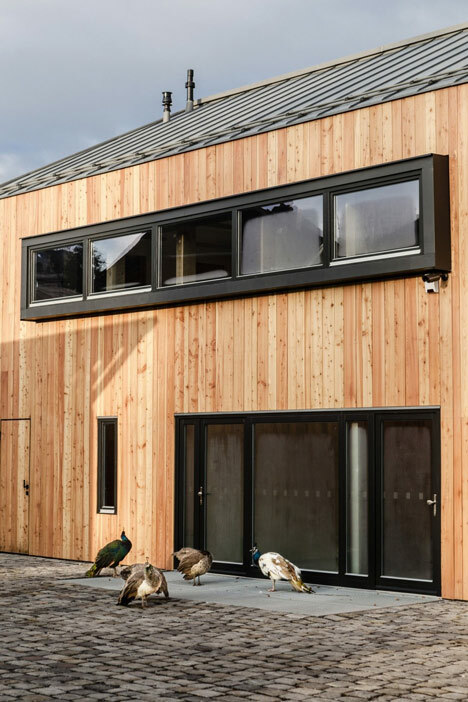 "The surrounding gardens were key to our architectural solution and we designed the buildings with humility to the historical environs," the architects told Dezeen. Photography is by Tomas Maly. The new complex of facilities for the gardens' operations and storage replaces the former, structurally unsound buildings. The dimensions of the newly-designed structures are smaller than those of the former operational facilities of the nursery. As a part of the completed project, this freed space will be restored and incorporated into the visitor's area of the garden. 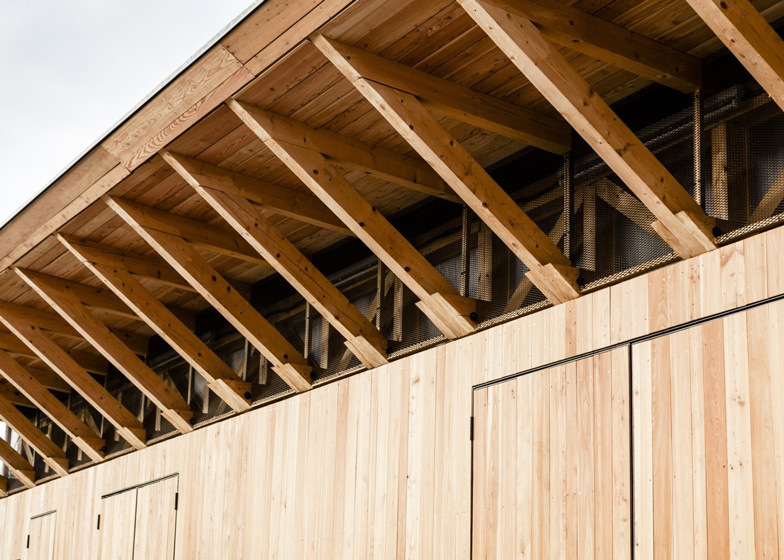 The new garden centre and storage grounds of the gardens are conceived as an interpretation of a farmyard, with wooden structures that combine traditional carpentry with modern technology and contemporary design. 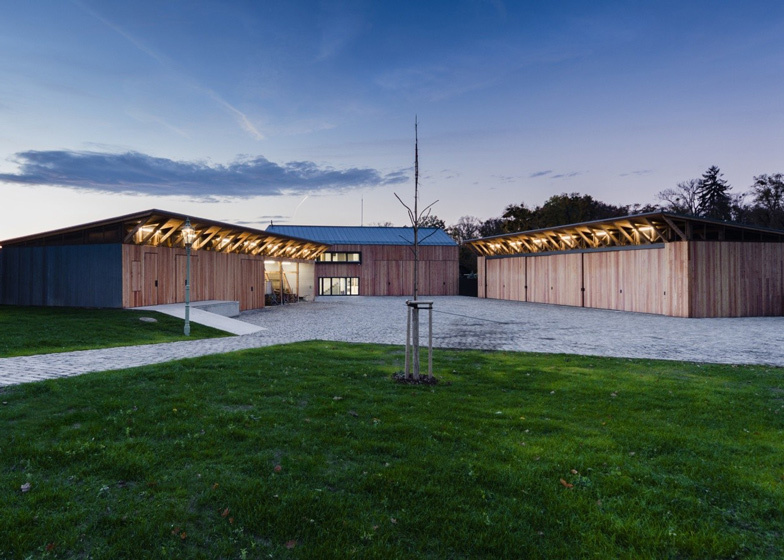 The design of each individual structure references the period in which they were built, but, at the same time, create the atmosphere of traditional farm structures. The fragmentation of the adjoining development made it clear that the area was in need of a simple, unified complex of appropriate size, in harmony with the atmosphere of the entire chateau complex. In keeping with the set layout parameters of the project, a composition of three simple structures was chosen. These structures surround the central courtyard, and are situated so that they balance the gradually developing "soft" character of the location. The western section includes a storage structure, while a garage housing garden equipment stands opposite, leaving the centre structure as a designated area for garden workers. The natural ageing of materials was taken into account during the design of the facades of the structures. The final appearance integrates the texture of oxidised and weathered wood, which will allow the structures to become an organic part of the old chateau gardens. The concept of intertwining the new with the old is reflected in the use of traditional cast-iron lamps and original stone paving in direct contact with new structures. 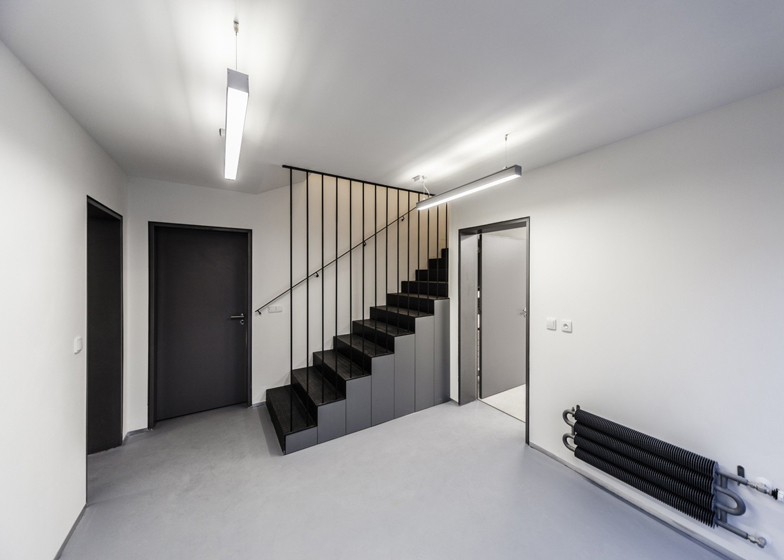 The moderately-insulated wooden employees' station and uninsulated wooden structures of the garages and storage areas are constructed using a system based on a frame module of 3.3 metres. This dimension is then divided in thirds, and emphasised in the diagonal features of the front facades of the single-level structures. The visible supporting elements are designed and constructed using classic carpentry roof constructions with tenon and bolted joints. The insulated two-story section utilises a frame construction braced with surface panels. The buildings are designed with concrete strip foundations, and portions of the structures are founded on piles due to the underlying large-diameter sewage canals. Two single-level buildings have single-pitched roofs sloped to the rear wall, while the two-story building sports a gable roof. 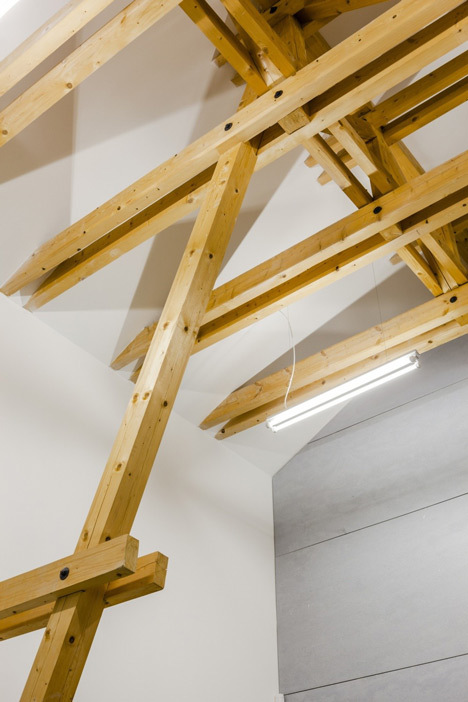 The roofs of the single-level structures (buildings B and C), as well as the roof of the two-story structure (building A) are supported by wooden purlin systems. 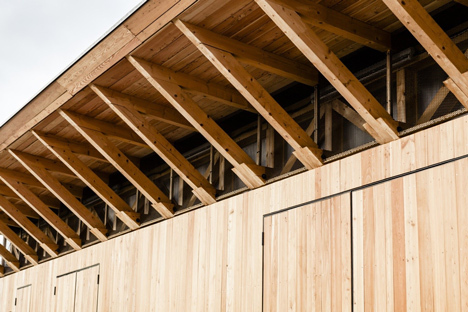 The finishes of the facades take into account flammability codes, and are therefore partially constructed using vertical larch panels, and partially using fibre cement segments. 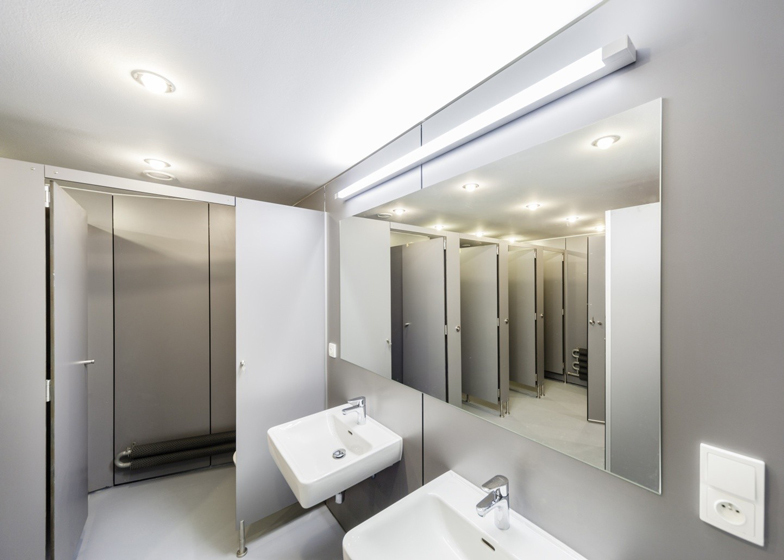 The insulated or fire resistant parts of the building are covered with fibre cement boards, water-resistant HPL boards and plaster fibre boards. 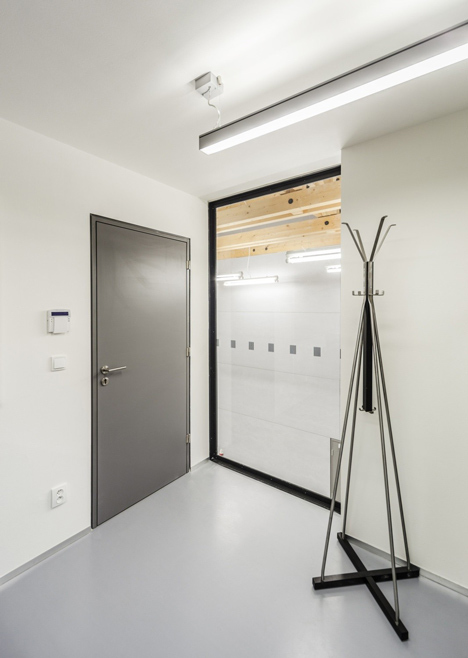 The nonstandard sliding doors leading into the uninsulated areas of the garage and storage buildings are finished with the same materials as the adjoining facades. The roof is covered with seamed sheets of titanium zinc.